Merger is nothing but amalgamation of two groups into single entity. Merger is a process of combining two business entities under the common ownership. Usually merger occurs when an independent bank loses its charter and becomes a part of an existing bank with. In 1960s, the Indian banking industry had turned into an efficient tool to facilitate the development of the Indian economy. At the same time, it had emerged as a large employer, and a debate had ensued about the nationalization of the banking industry. In 1969 the Prime Minister Indira Gandhi initiated the process of nationalization of banks. Since then a number of mergers have taken place. The year 1968 witnessed an ordinance issued by the Government of India and 14 large commercial banks in the country were nationalized. These fourteen banks, back then, contained a whooping eighty five per cent of the total bank deposits in our country. 1980, was witness to yet another round of nationalization and six more commercial banks came under the government control. With this huge leap, an enormous ninety one per cent of the banking sector came under direct control of the Indian Government. With this, the number of nationalized banks in India rose to twenty. Sometime later, in the year 1993, the government took yet another stride towards economic prosperity and made a turn towards merger of banks. The New Bank of India was merged with the Punjab National Bank (PNB). This was the first merger between nationalized banks, ever witnessed in Indian history and consequently, the number of nationalized banks in India was reduced from twenty to nineteen and that remains the same till date. In the present time, the recruitment to all the nineteen nationalized banks is by a Common Written Examination, which is piloted in the country, by the Institute of Banking Personnel Selection (IBPS). Indian banks have been welcoming towards the technological advances so far. 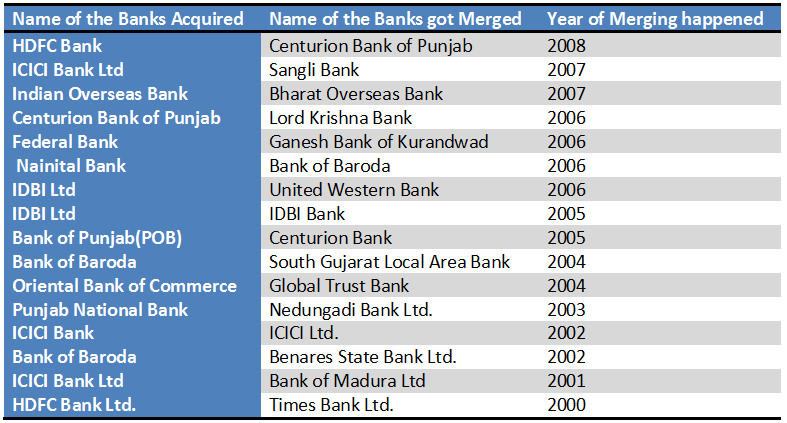 This has substantially given a rise to competition in the market and hence, several bank mergers have been witnessed in India, over the years. 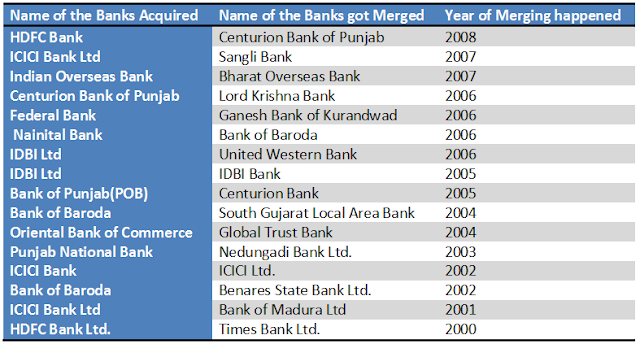 Here is a run through of the mergers that have taken place among Indian banks.